WOULD YOU LIKE BASIL PLANTS LIKE THESE FOR FREE? I’m always on a drive to save some money and what better way than to create something for nothing by propagating a few basil plants for free. One tip I was given a few years ago is to buy a basil plant off the supermarket shelf, usually cost around £1.60. You can find them usually next to the fruit and veg stand. When you get it home leave the plastic wrapper on until you’re ready to transplant but make sure you water it straight away. Basil has soft fleshy leaves which is usually a sign of a plant that needs to be kept moist. Next, take four three-inch plant pots (or larger) and half fill with good quality compost. I add a little bone meal into my mix because it will benefit from the extra nutrients. 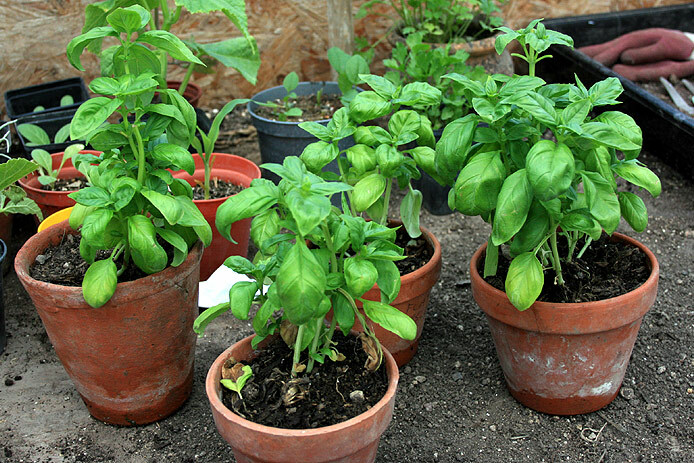 Gently take your basil plant out of its pot and work it apart into 4 smaller plants. It should come apart fairly easily, then, lant each one into its new pot and top up with a little more compost to just below the rim, and finally give it good water. Basil plants like warmth so best to leave them in the house until they start putting on new growth. By my calculations that’s just over 40 pence per plant which isn’t bad at all! Give it a try and see if you can get more than 4 plants from a single plant.